The first 3 stages present virtually no issues to defeat and most players will complete the first three stages without losing any Phoenix protection. The difficulty with the event comes entirely in Phase 4. The final stage will begin with Stormtrooper taunting. 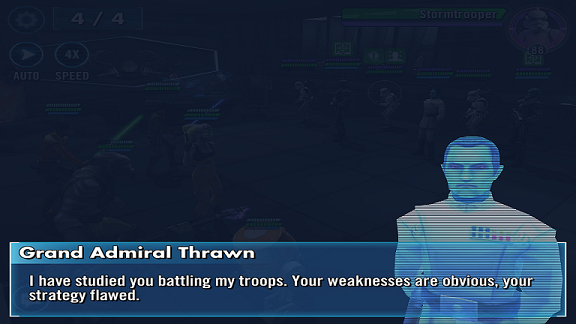 Removing this Taunt as soon as possible with Ezra or Chopper is the most important key to winning the battle. Thrawn will most likely use his Grand Admiral’s Command special to give 100% Turn Meter and added protection to any of the other enemies. If this ability is used to allow the Stormtrooper to Taunt again, it is imperative to have a second Dispel available to remove this Taunt as well. The Death Troopers will each use Death Trooper Grenade AoE abilities as their first attacks. As long as Kanan is still active, Phoenix should all Counter with these AoE attacks. The goal is to allow these attacks to occur while Stormtrooper is not using Taunt so that when Phoenix all Counter, they will Counter against the two Death Troopers instead of the taunting Stormtrooper. One of the most difficult parts of the process is setting up the Dispel abilities for Ezra and Chopper in Stage 3 so that they are the first attacks that will be used in Stage 4. Going into Stage 4 without the ability to Dispel the Stormtrooper from his first and second Taunts means the battle will drag out for much longer. The longer the battle continues, the more likely players are to make a mistake and the more likely it is that Thrawn will Fracture a key ally or allow other enemies to regain too much health and protection to defeat. Your first move in Stage 4 is to Dispel the taunting Stormtrooper and to Dispel him before the Death Troopers perform their AoE attacks. If the Death Troopers manage to do their AoE attacks with Stormtrooper still taunting, still Dispel him quickly. There is a very high chance that Thrawn will use his Grand Admiral’s Command special and allow Stormtrooper to Taunt almost immediately after the initial Taunt is removed. This is why it is imperative to use both Ezra and Chopper and ensure both of their Dispels are available at the very start of Stage 4. The Death Troopers are fast and, while they will not apply Death Mark in most cases, they will apply other debuffs that will inhibit turn meter and health regain. As soon as Stormtrooper’s Taunt has been removed, all focus must be on the Death Troopers. Kill one and then the other. Do not focus on anyone else while the Death Troopers are still alive. If Stormtrooper gets Taunt again, Dispel him again, and continue working on Death Troopers. Once the Death Troopers are down, the battle will become a bit easier. The Commanders are Healers and some players choose to kill them first. That said, there are two of them and it is possible to focus on one Commander, but then the other heals, then Stormtrooper regains his Taunt, and you could end up in the same place you started after multiple turns. It is advisable to focus on Stormtrooper in hopes of forcing the Commanders to use up their heals in the time it takes to kill Stormtrooper. Once Stormtrooper is down, focus on one Commander and then the other. 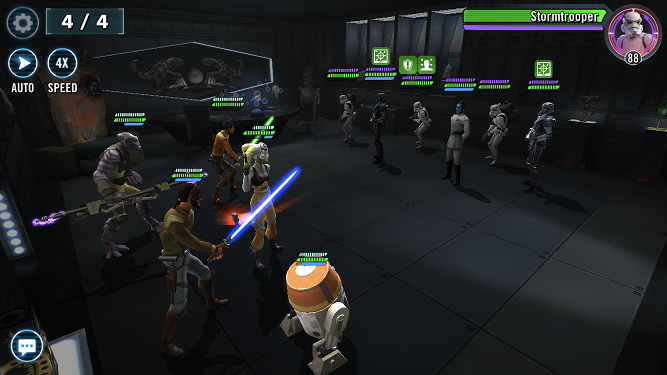 Despite killing the five other enemies, the battle can still be easily lost with just Thrawn remaining. 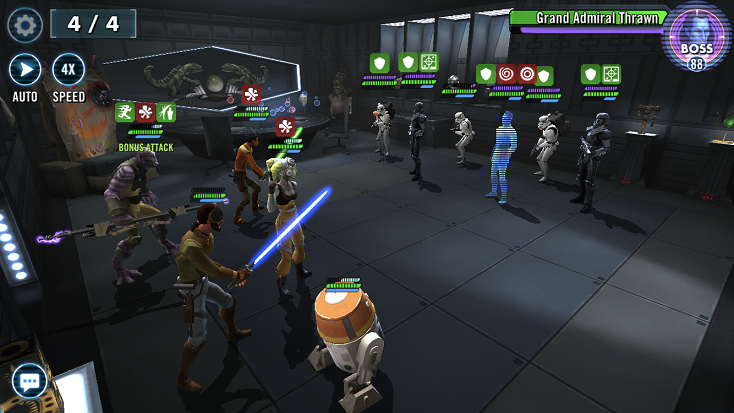 At this point, all attacks will be focused on Thrawn, but it’s important to try and land the relevant debuffs on Thrawn and in the proper order. Zeb becomes extremely important in keeping Thrawn in check. Use Zeb’s Staggering Sweep to land Stagger onto Thrawn. Stagger should be added only after Thrawn has used his Grand Admiral’s Command special. 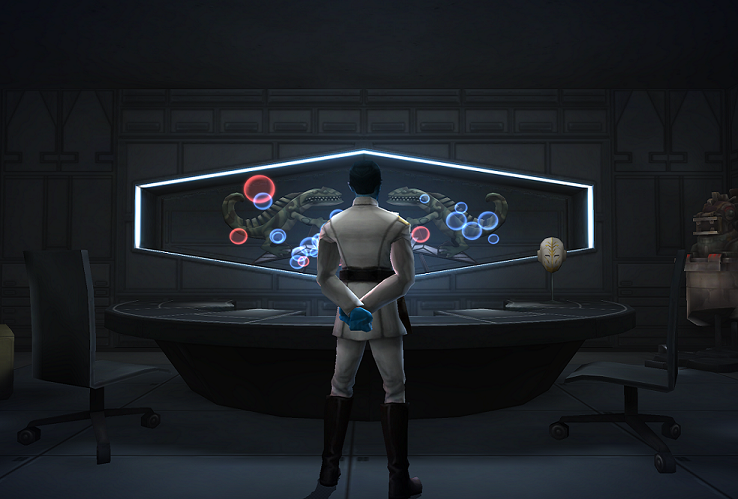 If Stagger is added beforehand, Thrawn will use Grand Admiral’s Command and clear the Stagger debuff. Once Stagger is on Thrawn, on Zeb’s next Basic attack, Thrawn will be stunned. This is easier to do when there are other enemies still on the floor, but can still be achieved with just Thrawn if Hera’s Basic has landed Expose on Thrawn. As long as Thrawn has Expose, Daze, or Stagger, Zeb’s Basic attack can stun Thrawn. Another way to stun Thrawn would be to use Zeb’s Basic to apply Daze and, on Hera’s Play to Strengths ability, select Zeb, who will use his Basic again, which should hopefully Stun Thrawn. Option Three would be if Ezra gets a turn before Hera or if Ezra is next up and Stagger has been applied to Thrawn. Use Ezra’s Watch and Learn ability and select Zeb. This attack will allow Zeb to use his Basic which should Stun Thrawn and then Ezra will assist with a powerful hit as well. While attempting to Stun Thrawn, it’s also important to keep Kanan alive for as long as possible. All Phoenix receive a high counter chance through Kanan’s Unique, but as soon as Kanan is killed, Phoenix will no longer counter. As soon as it’s available, use Hera’s Backup Plan on Kanan. This will ensure that if Kanan is killed via his taunting or through Thrawn’s Fracture, Kanan can be revived and keep the whole team countering. Hera is needed to keep using Zeb to assist and hopefully stun Thrawn and she is needed to keep Kanan alive, so to keep the focus off Hera, let Kanan Taunt (with Backup Plan Buff), or use Chopper’s Taunt to force Thrawn to Fracture anyone other than Hera, Zeb, or Kanan. Ezra is going to be your major damage dealer through the full battle. Use Flourish each time it appears, regardless if Thrawn has a buff or not, and always call Zeb for Watch and Learn. Once the battle is down to just Thrawn, the goal will be to whittle down Thrawn until he’s down with whomever you’ve got left.